The discovery of Pastor Llewellyn Lucas’ head in the pan of a pickup truck, led to the arrest of William Mason, Ernest Castillo, Keron Fernandez, Ashton Vanegas, and Terence Fernandez. 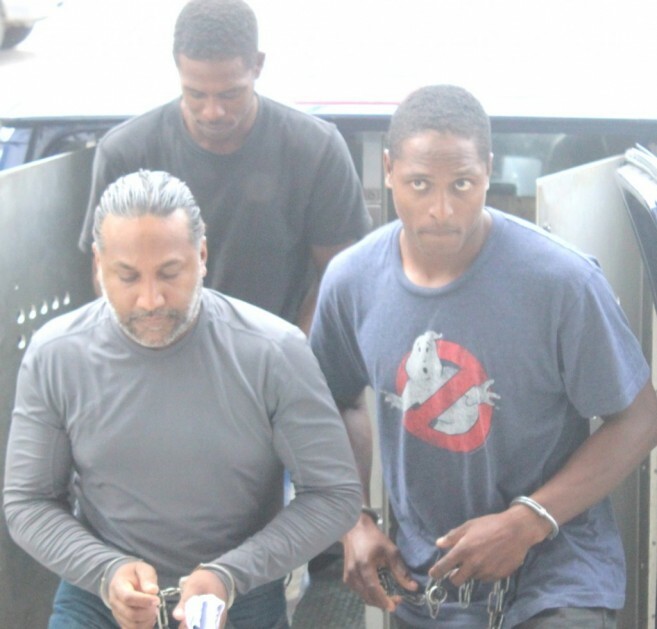 The gruesome discovery happened on Friday, July 15th in the Belmopan area, and since then the five men have been remanded to the Belize Central Prison. As news quickly spread, factual evidence began surfacing, revealing close links between the international con artist and current high officials in the Government of Belize. According to police, they had been tracking Mason for quite some time after learning about a number of criminal acts he was allegedly involved in. However, they could not act, due to lack of reports being filed by his victims. However, on that Friday, acting on information from their investigation, police conducted a search on Mason’s vehicle, discovering the severed head along with other incriminating evidence. The four men arraigned were with him at the time of the search. In the days after, it became public knowledge that Mason had been scamming several businesspeople in Belize and other countries. It was also revealed that he had close connections with certain high government officials, one of those being Belmopan Area Representative and Minister of National Security Honourable John Saldivar. Saldivar has been staunchly defending himself against any accusations of an illicit relationship with Mason. He also added that his contact with Mason was minimal and strictly business. In an interview with the local media, Saldivar explained that after hearing shady stories about Mason, he discontinued any further affiliations with him. Mason had apparently been contributing financially to Saldivar’s football club, ‘The Belmopan Bandits.’ According to Saldivar, the contribution summed up to around $50,000 over time. However, he made it clear that there were no strings attached following such sponsorship by Mason and there was no close association either. “I have not had any contact with Mason since last year September. That’s what I’ve said and I stand by that,” said Saldivar. “He had also been contributing to other semi-pro football clubs in the country at the time he decided to help my team. But for the past two seasons, he has not contributed. Thus, he is not a part of my organization anymore.” However, in a recent testimony from Mason, who is behind bars in special facility for high risk prisoners at the Belize Central Prison, he stated that he owns 30% of the Belmopan Bandits and has continued financing the football club. He also indicated that Saldivar maintains a close relationship with him, visiting him at his house and even spending the night. Mason said that this happened well past September of last year. Mason also revealed that Saldivar had facilitated his acquisitions of six gun licenses, including 9-mm pistols, a point 38-caliber, and a shotgun. The accused murderer and kidnapper also revealed that he owns a company that is allegedly in charge of the works at the new Pediatric Ward at the Karl Heusner Memorial Hospital in Belize City. Prime Minister Dean Barrow briefly came into the picture and told reporters in Belize City on Wednesday, July 20th, that to his knowledge Mason was a man you could not trust. “The man will rob you blind,” he said. And to make matters worse, according to him, no one decided to report it. Barrow indicated that he was made aware about the kidnapping of a Canadian Mennonite couple three weeks ago. He further mentioned that as of that time, the victims did not make a formal report. They recently approached the police to give their testimony on the incident, but reports are that they have since left the country. In the days following the declarations of Saldivar and local authorities on the growing scandal, the response from the Leader of the Opposition, Honourable John Briceño came next during a press conference on July 20th. Briceño called on the government for the removal of Saldivar, and to have a private investigator take over the case. He stated that this is necessary as the local authorities cannot investigate their own boss. According to Briceño, Saldivar is compromised by his past connection with Mason. “It seems that Mason provided unlimited financing to well-connected people and no doubt expected in return, unlimited protection and financial gains,” said Briceño. “The affair between Mason and members of Barrow’s Cabinet and by extension, several police officers, lead us to believe that the police cannot be expected to properly and exhaustively investigate this case.” Briceño called out on Prime Minister Barrow to publicly reprimand members of his cabinet who were rubbing shoulders with Mason. He touched on the involvement from other ministers who were closely associated with Mason, particularly Dangriga Area Representative and Minister of State for the Public Service, Energy and Public Utilities, Honourable Frank ‘Papa’ Mena. Mena admitted receiving $10,000 for his campaign in the by-elections in July of 2015. Mena won that election against Anthony Sabal from the People United Party and Independent Candidate, Pastor Lucas (the victim). In a recent release from his office, Mena has indicated that he was first introduced to Mason, who claimed to be a businessman, through former PUP Stann Creek West Area Representative and former CEO of Citrus Products of Belize Limited, Dr. Henry Canton. Before he won his seat in the by-election, he said that he was taken to Mason’s house by colleague Minister Saldivar. Mason has been named by several internet sources in numerous multi-million dollar scams. He goes by several aliases, including Danny Ouellet, Ted Ouellet, Danny Mason and Raj Ouellet. He known to hold Belizean, Guyanese, and Canadian nationalities, including a Belizean birth certificate saying that he was born in Crooked Tree Village, in the Belize District, to James Mason and Sharon Tillet. In the meantime, while police continue investigating, Mason and his accomplices are expected to appear in court on Wednesday, September 14th.